Okay, I promise, I will try to make this the last biking post for a while. This past Sunday was the Chilly Hilly. 32 miles, 2400 feet of elevation gain (plus 14-15 miles riding to and from the ferry and a few hundred more feet of climbing coming home from the ferry). Despite having done the mileage and the climbing in previous rides, I was still nervous. Ryan wasn't terribly understanding of this, but some of my nerves was due to having very few long and/or hilly rides under my belt and part was due to knowing I'd be riding at the same time as lots of other people, which I hadn't done before. Our group of three left our houses at 7:45. The ride to the ferry is primarily downhill, which makes it a cold ride that time of morning. Luckily it was forecast to be a sunny and warm (for February) day, so we knew things would improve. 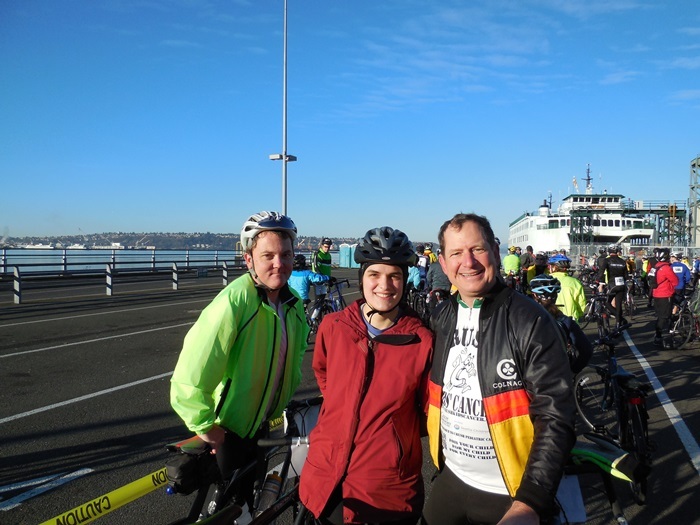 They filled the 8:50 ferry with bikes rather than cars, so we were going to be starting the ride with a very large crowd. Things were quite crowded initially, which takes some getting used to. But eventually the fast people work their way ahead and the slower people drop behind and so everyone gets spread out. It was a lovely day, with some beautiful views. I didn't take any pictures. Should have, but honestly was just trying to make it through the ride and didn't want to stop too often. I was definitely the weak rider in our group, but my friends were kind enough to slow down for me. If you want to see the pictures the official photo people took of me riding, go here. 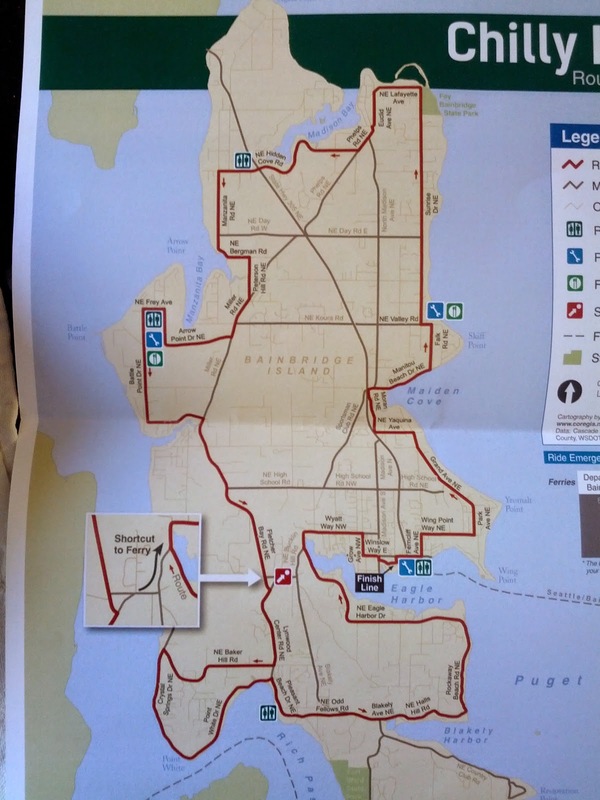 While the Mercer Island loop approximated the distance and the climbing of the Chilly Hilly, it turns out that Mercer Island is way, way easier. On Mercer Island, almost all hills are preceded by downhills, allowing you to use the momentum from the down to coast most of the way up. A lot of the climbing is made up just from gentle rolling hills. Very few actual climbs. There's definitely a lot of that on Bainbridge, but Bainbridge also has 4 good climbs, some of which are just preceded by flat stretches. Not to mention that even if there is a downhill, when you're riding with a crowd of people it's difficult to gain a lot of momentum on the slope if you're also trying not to run into anyone. But I made it, and I didn't walk up any of the hills. I was glad that I maintained my average speed from previous rides, meaning the ride took us 3 hours. We gave ourselves a chance to relax a bit when we were done. We missed one ferry because of this, then missed the next one because the line of cyclists trying to get on was huge and they were letting mostly cars on. So while we finished the course at 1, we didn't get home until about 5:30 (had to ride home after getting off the ferry). All the other riders were pleasant and polite. There were people on tandems, parents pulling kids in trailers, a few recumbent bikes, and even a couple kids right around Gareth's age on their own bikes (usually they ended up walking some of the biggest hills). As far as we saw, no one ended up injured. It was fun to see the Bainbridge families standing in their driveways, cheering us on. Some even offered cookies and drinks. There was one point where a guy was up in a tree doing some trimming and as I rode past he screamed out that he was bleeding. Luckily it sounded like he had co-workers there to help him, and some cyclists who were taking a break ran over to see if they could help. I kept going because there wasn't anything I could offer in the way of help. Hopefully he's okay. When I got home, Ryan looked up his co-worker's Strava account of the ride and helpfully informed me that I wasn't as fast as his co-worker, who finished the course in two hours. My goal for next year is to have the climbs not feel quite as horrible. And maybe Ryan will be up for joining us next year. It's definitely a good ride for a first organized ride. Of course, it helped a lot that it was neither rainy nor terribly chilly. I probably would be looking on it much less fondly if it had been either of those! Well done! Whether or not you were as fast as Ryan's coworker, the whole day sounded like quite the accomplishment. All your posts have really got me itching to do some biking!